“Green building has been at the forefront of the media over the past several years. The reality is green building is not a fad and will continue to revolutionize the building industry.” The truth of this statement from D.J. Ketelhut, director of sales for Quad-Lock ICF, is becoming increasingly apparent. Builders, contractors, and designers who are able to capitalize on this movement are doing much better than those who aren’t. A recent report published by McGraw-Hill Construction and the NAHB reports that 56% of builders find “building green” makes it “easier” or “much easier” to market in a down economy. Fully 60% of builders claim home buyers are willing to pay more for green homes. Most importantly, 85% of builders think energy efficiency is the most important feature of an environmentally friendly home. This is great news for the ICF industry because insulated concrete forms are arguably the most cost-effective type of energy efficient construction. Concrete, by itself, has many advantages in the green construction market. 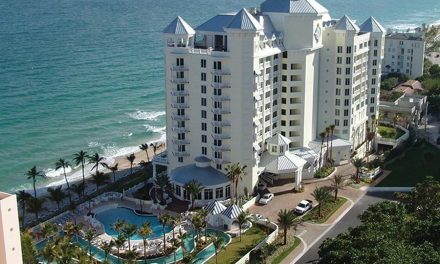 It’s extremely durable, low-maintenance, and resistant to disasters like hurricanes, wildfire, and tornado. It’s also healthy. It resists mold and moisture, is composed of locally extracted materials, and can be recycled as aggregate after perhaps centuries of use. Additional green value can be gained by using fly ash or silica fume in the mix design in place of Portland cement. The PCA conducted a study in December 2008 that found a significant share of homeowners recognize these advantages. According to their report, 1 in 3 homeowners (30%) viewed concrete as the most environmentally friendly material, compared to wood- or steel-framed construction. They cited durability and energy efficiency as the most important characteristics. Whether or not the green building systems accurately rate the impact of construction on the environment is a hotly debated topic. These guidelines are constantly being revised to better reflect what a truly green building is. Still, under the current systems, concrete can contribute significantly. The thermal mass and air-tightness of the wall (discussed in more detail below), as well as the recyclable aspects already mentioned, make it clear concrete is a great choice for environmentally friendly construction. By itself, however, concrete fails as a truly green material. It is only when it is combined with stay-in-place, insulated concrete forms that concrete becomes a sustainable material for wall construction. This article addresses five benefits foam forms add to concrete walls: energy efficiency, noise reduction, reduced lumber usage, indoor air quality, and life cycle (building life span). Energy Efficiency: Concrete alone is not energy efficient. In fact, it’s one of the most conductive materials used in wall assemblies, with an R-Value of 0.08 per inch. 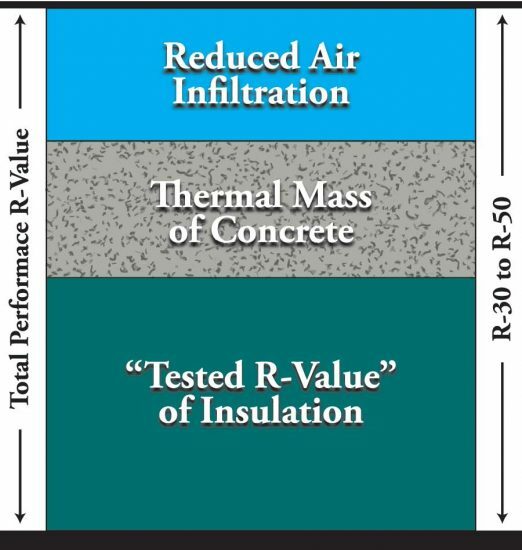 But with two inches of EPS foam on each side of the concrete wall, R-Values rise to a lab-tested values of R-20 to R-22. Many ICFs offer thicker foam, with Quad-Lock and Logix offering tested R-values of more than 40. The key to sustainable building is saving energy and reducing carbon emissions. About 90% of the energy used in a building’s life span is the heating, cooling, and lighting of the building. Because energy usage has such an enormous impact on the environment, energy efficiency is the major focus of every sustainable building program. EPS foam is one of the most efficient materials yet invented to reduce the conduction of heat from one side of the building envelope to the other. Per inch, it’s more efficient that blown cellulose or fiberglass batts. Additionally, it’s continuous. There are no gaps or holes, like fiberglass batts often leave, and there’s no framing members (steel or wood) to create thermal bridging. Combine that with the fact that ICF walls are virtually airtight. In blower-door tests, ICF homes usually score between 0.5 and 1.5 air changes per hour (ACH). That’s compared to 3-4 ACH for framed homes built to current standards, and 12 and 14 for older framed homes. Finally, the thermal mass of the concrete wicking up heat from below the frost line acts as a thermal damper. Studies are currently underway to find out exactly how much of a benefit this thermal damping provides, but anecdotal evidence suggests it is considerable. 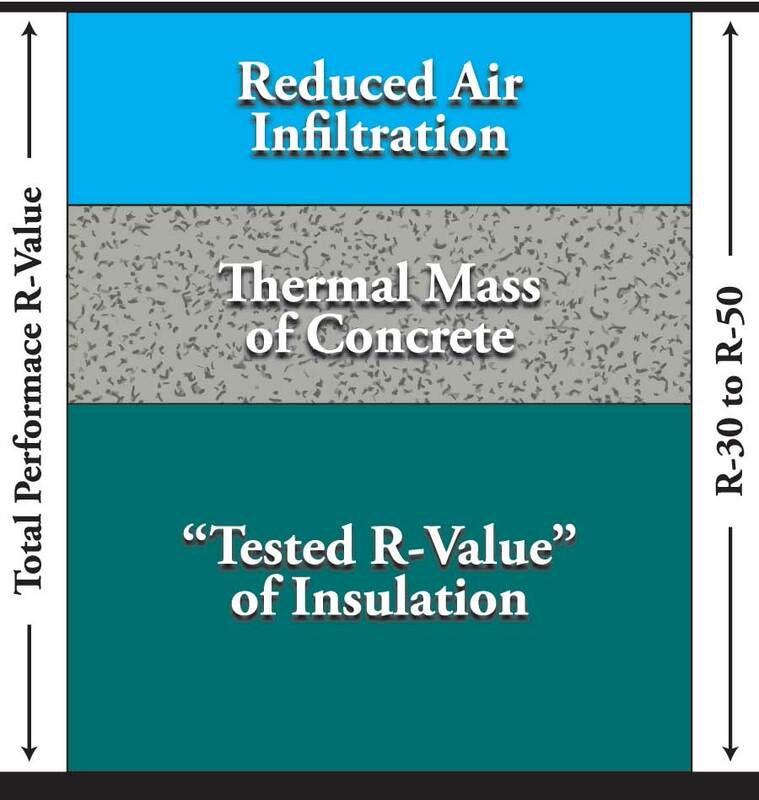 Together, the three elements (higher R-Value, reduced air leakage, and thermal damping) produce a wall of unrivaled efficiency. Quad-Lock reports that when a lab tested their R-30 wall assembly, it took 11 days for opposing sides of the wall to become equal in temperature. Testing staff claimed a wood or metal structure would reach equilibrium in a matter of hours. And that’s without real-world factors like wind figured in. Noise Reduction: Decreasing indoor noise is also a component of building green. Studies have shown that prolonged exposure to noise—from airplanes, rail and traffic—can cause can cause hypertension, sleep disturbances, and high stress levels. The same EPS foam that provides thermal insulation also provides outstanding noise reduction qualities. ICFs’ sound attenuation has been recognized for years; that’s why they’re a popular choice for theater construction. But they also have a proven track record quieting noisy environments. With STC ratings vary between 50 to 55, ICFs have been used to create safe, quiet living quarters in otherwise unbuildable environments. 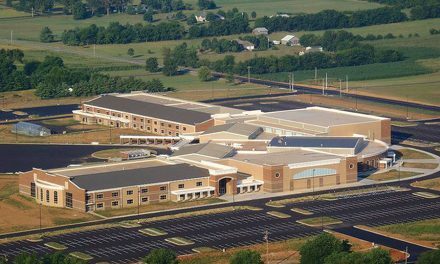 Reduced Lumber Usage: Admittedly, most concrete structures—be they CMU, removable form, or tilt-up—are often insulated and sound-proofed. But this requires furring out the walls with wood studs, and then adding insulation. This leaves them prone to the disadvantages of batt or blown-in insulation. It also negates any potential benefit of reducing the number of trees used. With ICF construction, furring is not necessary. ICF houses save an average of 50 trees per home. They also eliminate the labor and construction steps involved with stripping forms, framing out, and insulating the wall. Better Indoor Air Quality: The two biggest causes of unhealthy air are mold and volatile organic compounds (VOCs). ICFs help eliminate both. As discussed above, ICF construction can eliminate much of the wood associated with traditional construction. By reducing the amount of wood used in the home, they reduce the risk of mold, mildew, and associated odors. EPS foam simply is not a food source for fungus as wood is. Regarding VOCs, the Canadian Mortgage and Housing Corporation (CMHC) conducted a study in the mid-1990s that is still a benchmark. 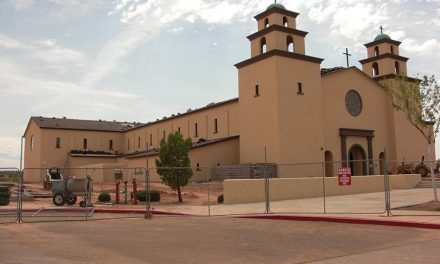 They tested 37 construction materials, including four concrete wall systems, for VOCs. 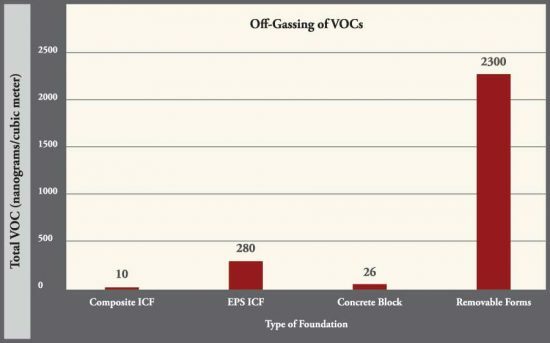 The chart above, taken from the report, summarizes the VOCs found in the foundation materials tested: a composite ICF, an all-foam ICF, concrete block, and wall made with removable cast-in-place forms. As the chart shows, both types of ICF wall produced less than one-tenth the VOCs produced by the removable form wall. 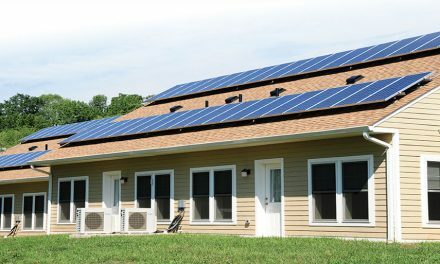 The PCA recently re-released a report comparing the life-cycle of an ICF home to a traditional wood-framed one. Interestingly, this study did not include disaster resistance or occupant comfort and arbitrarily set the life of each house at 100 years. Still, the ICF home easily outperformed the wooden one. “The LCA was carried out according to… ISO 14044, Environmental Management – Life Cycle Assessment,” the report reads. The two hypothetical houses were compared via computer simulation in five cities, representing a range of U.S. climates: Miami, Phoenix, Seattle, Washington D.C., and Chicago. Construction is clearly moving in the direction of sustainability. 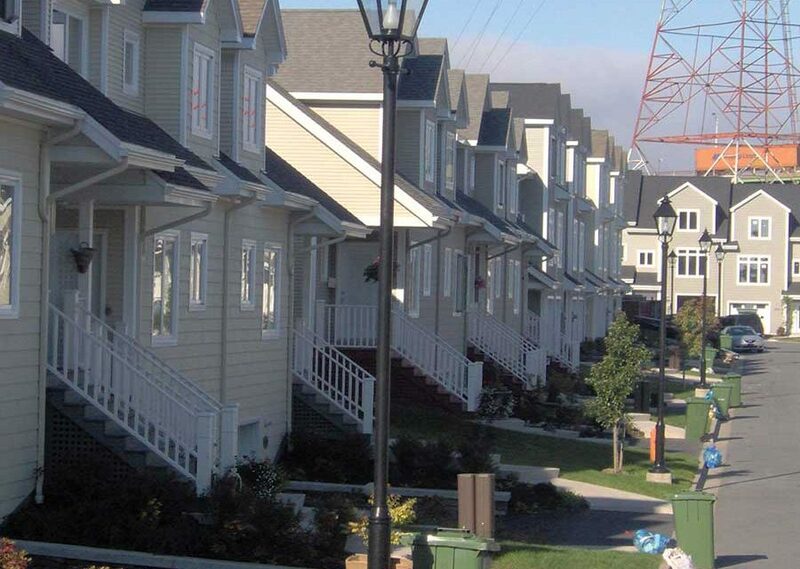 The ICF industry has a product that is considered best-in-class in five areas: energy efficiency, noise reduction, indoor air quality, lumber usage, and life cycle. It is clearly the most sustainable form of concrete construction. Whether those advantages can be turned into better market penetration remains to be seen. Most industry executives are optimistic. Hubert Max Kustermann, CEO of Quad-Lock, wrote in a recent newsletter, “Concrete construction of detached homes has now reached a market share in the US and Canada of about 18% and has been continuously growing from a 3% share in 1993. This growth is irreversible and will continue, probably at an exponential rate.